"Ruby and Diamond Horseshoe Necklace"
Horseshoe necklace offering rubies and diamonds. The Gorgeous Horse is your source for horseshoe jewelry. 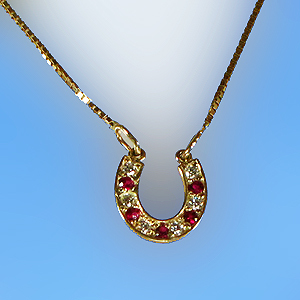 Ruby and diamond horseshoe necklace offered in 14kt yellow gold. Necklace is 18" box chain. Dimensions: 1/2inch x 1/2inch with 18" box chain included.